When I was eleven years old—in a very small town in the middle of Nevada—I first played Dungeons & Dragons. The other players were a lot older, and the overall experience was not good. But there was something about it all that opened my imagination in ways I never thought possible. Shortly thereafter, my friend Robbie and I picked up the Red Box and ran solo adventures for each other (I did mention it was a very small town, right?). Fast-forward a few years, and I’m playing a wide range of games—though by now my life-long love affair with BattleTech has begun, so that swallows a large swath of gaming time. But we still do a lot of roleplaying across a wide range: Star Frontiers, Gamma World, TMNT, Paranoia, Marvel Superiors, Heroes Unlimited, and because that’s what our main GM Scott enjoyed running, a lot of Palladium. However, many an evening was spent with D&D books. 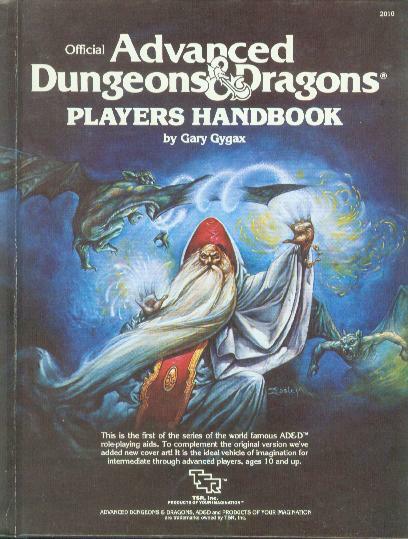 And often it would just be Tony and me thumbing through the Advanced D&D Players Handbook, which never ceased to inspire the imagination (that cover still instantly takes me back). Fast-forward a whole pile of years and my teenage son, Bryn, has built a large gaming group. For his years 17-19, like clockwork, every Friday was game night. We played almost every type of game under the sun, and having only five show up was usually considered a small night. But around their Senior year—the group had grown to almost a dozen by then—they all started to mention they’d not done any tabletop roleplaying. Despite the pile of work I knew was coming, I simply couldn’t be me (much less a professional in our hobby) and look at that many kids wanting to learn roleplaying and not make it happen. Especially as serendipity struck and D&D Fifth Edition had just been published; having read it, I knew I’d enjoy running it. For over a year, we ran a bi-monthly campaign (which turned into a weekly campaign after graduation before they all started heading off to collage). And yes, a few times, there were twelve gathered around the table! Stupid, inbred Hydra that couldn’t touch them the first time that happened; I quickly realized how much more dangerous I’d need to make a session for that many players. Regardless, just an endless pile of awesome fun all around, with stories we’re still sharing (as all roleplaying inevitably provides). To the point I’d started running a game for my family (well, until Dragonfire came along and sucked up all possible bandwidth in my life). As a fantastic aside, almost all of those kids (not really kids any more) have joined—and often started—their own roleplaying groups. Both job security and proud geeky-gamer dealer. Okay…why that trip down memory lane? Because for an exceedingly large swath of our hobby, each of us has our own story about how much Dungeons & Dragons has informed that experience. Even if you went long, long years without touching it—as I’ve done—it still formed a crucial crèche of development. A touchstone across so many years. Literally, our hobby would be utterly unrecognizable to us if there’d been no D&D. (Much less how far the impact goes into all our favorite computer game.) And if we were going to create a game set in such a seminal universe, it needed to pay the utmost respect to that heritage. Which means that back in December, when the design of Dragonfire began in earnest, we spent a solid two weeks meeting every other day with white boards and just talking at a macro level. What makes Dungeons & Dragons, well…Dungeons & Dragons? What’s that ultimate shared experience? There’s hundreds—if not thousands—of roleplaying games and settings. So while there will be core elements drawn across most of those, what elements are most important to the D&D experience? What aesthetic, if missing, would tear out the soul of D&D? Based upon those discussions, long lists were created and then honed. And while yes, there were exceedingly strong opinions thrown around, I think what surprised me the most is how similar the lists were for each of us. Sure, there were one or two outliers—hence those strong opinions. But by-and-large, the lists aligned, despite a wide range of experiences with the game. This made it all the more crucial that we appropriately fold those elements into Dragonfire, as most players coming to the table will likely have very similar lists in their own heads. For example, for the Encounter cards (the monsters you must defeat during the game), the columns would have headers such as “Most Damage,” “Most Discards,” “Deck Cycling,” and so on. You’d then plug in color types; i.e. Blue does the most damage. After that you start plugging in the Market cards—those you’ll purchase during the game to increase the strength of your deck—with similar, but importantly different headers, such as “Most Assists,” “Most Healing,” and so on; i.e. Green does the most healing. And the spreadsheets build out from there. To help us in this all-important foundational work, we borrowed a brilliant design idea from Wizards of the Coast that they use when building new Magic: The Gathering sets: a color wheel. A nice, quick and easy visual that ties over-all Creative and Design into a reference that ensures everyone is on the same page as we started to divide up the work and start into the game design in earnest. While Loren dove head first into the Market design, I took over the Encounters and started crafting a truly epic spreadsheet…and Dragonfire was born. In the coming weeks I’ll be posting regularly, traveling the labyrinthine passages of design; showcasing how the game plays; providing sneak peaks at some incredible new art we’re adding to the Dungeons & Dragons mythos; even looking at the graphic design process and the dozens of iterations we went through—working closely with the great folks at Wizards of the Coast—to reach a final form; and more. I hope you’ll join me each week, here, and enjoy this new, exiting adventure along the Sword Coast, and beyond!